Authored by brauch on Aug 14 2018, 10:32 AM. This is a slightly modified version of the InlineNote interface written by Michal in D12662. I'm not sure about which API is better, the old suggestion or this one. The problem I see with the old one is that you need to return pointers to instances of the notes, which you need to memory-manage yourself. This means you either allocate all of them immediately, or you need some rather complex tracking of what instances you created and when to free them again. Effectively, I tried to implement inline error display (see attachments below) for KDevelop, once with the API from the other patch and once with this one. The amount of lines is approximately the same, but with this API, you can implement it only as a view on top of what's already there, i.e. you only add three member functions which return things based on the existing data. With the other API, you need a vector as member which contains all the notes instances and you need to manage that. I think the problem with the old interface that you described is valid. This version gives more flexibility to the InlineNotesProvider with regards to how it stores the notes internally. Do you have plan how to track the movement of the notes during edits? Maybe the InlineNote could also hold revision number for which it was created? Perhaps this could be QVarLengthArray of some size too? About the tracking, I don't think anything is needed on the side of the interface. 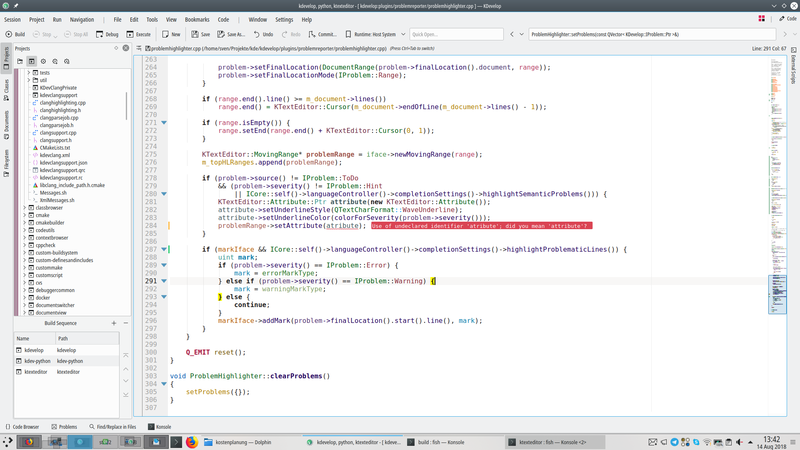 You can see how you can potentially do it in the KDevelop patch I attached: create a moving cursor for the location you want the note to track, and then compute the note's position from the moving cursor's position as needed in the getter each time. I think this is even better than doing it in the interface itself, since it is more flexible with regards to how exactly the moving cursor behaves. Regarding the QVarLengthArray, performance-wise it would be better, but it makes the public API ugly (QVarLengthArray is a relatively internal, hacky class which is supposed to be only used in special cases), so I think we should first profile whether this is a bottleneck in any possible use case (it probably isn't). Currently, I'm trying out whether we can add some simple interaction ("note clicked") as well already, since I think that would be nice long-term. If the API is nice, we can fix small uglyness like the cursor navigation around notes at any later time IMHO. or execute actions when clicking. You should even be able to e.g. I would not implement any function inline and just hide their implementation in the .cpp to be able to alter them later (for InlineNote). For the activation, I would like to be able to differentiate between the different mouse buttons like the qt mousepressed stuff would do. Please add a d-pointer as placeholder. can you try making all variables private? I think one more iteration, and this can be merged. Can you look into this again? Could we have also InlineNoteProvider and InlineNote? Btw, as license I would previer LGPLv2+ (as it currently is stated) +e.V. option to relicense. We discussed that here, and let's use QVector for now. If this turns out to be an issue, we will change for KF6. API docs missing for InlineNote, but we can add that later. please initialize all members in-class. brauch marked 21 inline comments as done. I think the Provider needs not to be an QObject, just an interface, IMHO. Avoiding the QObject inheritance requires some ugly QObject casts, therefore we keep that ATM. We merge it that way and talk tomorrow morning once more about that detail.